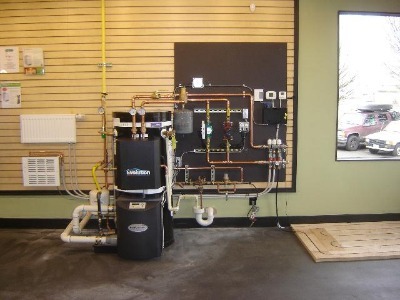 Welcome to Hy-Tec Custom Hydronics where we build a radiant heating system specifically for you. If you haven’t visited the aspect of radiant heat before or if you’re an old pro looking to update to the new and more efficient technology. Our goal is to make you the most comfortable you’ve ever been in your home. We at Hy-Tec believe that radiant heating is arguably superior to convection methods because warm, buoyant air rises wastefully to the ceiling in convection-heated rooms, warming the upper body (often with some discomfort, particularly to the head) but leaving the lower body cooler. In contrast, in-floor radiant heating warms the lower part of both the room and the body because when warm air convects from the radiant floor surface, it loses approximately two degrees Celsius at two meters above the floor. This imparts a feeling of natural warmth, since the limbs should ideally be warmer than the head. Under floor heating is invisible from above and does not use valuable wall space with unsightly heating equipment. In a sense, the entire floor is a radiator, although, because of its area, it need not reach the high temperatures of a steam radiator. It has a particular advantage in public areas where exposed hot or sharp surfaces can be dangerous and unsightly. Hydronic Radiant Floors SystemsHydronic (liquid) systems are the most popular and cost-effective radiant heating systems for heating-dominated climates. Hydronic radiant floor systems pump heated water from a boiler through tubing laid in a pattern underneath the floor. In some systems, the temperature in each room is controlled by regulating the flow of hot water through each tubing loop. This is done by a system of zoning valves or pumps and thermostats. The cost of installing a hydronic radiant floor varies by location and also depends on the size of the home, the type of installation, the floor covering, remoteness of the site, and the cost of labor. So-called "wet" installations embed the cables or tubing within a solid floor and are the oldest form of modern radiant floor systems. The tubing or cable can be embedded in a thick concrete foundation slab (commonly used in "slab" ranch houses that don't have basements) or in a thin layer of concrete, gypsum, or other material installed on top of a sub floor. If concrete is used and the new floor is not on solid earth, additional floor support may be necessary because of the added weight. You should consult a professional engineer to determine the floor's carrying capacity.